Grocery shopping would take me hours when we first moved to Paris. I didn’t know how to answer when asked if I wanted a yellow chicken, or a black footed one. I’d find myself completely flummoxed in the butter aisle and simply lost among the yogurts. It took an entire year for me to understand the cheeses and another year before I was ready to tackle a topinambour (Jerusalem artichoke). Having spent nearly half of my life as a vegetarian it is ironic that I have never completely conquered the produce aisle. There are some weird insect-looking vegetables that I can’t even name and the variety of fruits has just seemed like more than I ever needed to know. But last week, while shopping at the Grande Epicerie du Bon Marché I didn’t know which tangerines to buy and I felt like an utter idiot. I don’t like feeling like an idiot, so I asked the charming gentleman who operates the scales for a bit of advice. He was my go to man for any produce question I had when we lived across the street from the Bon Marché nearly a decade ago, and he still remembers me. 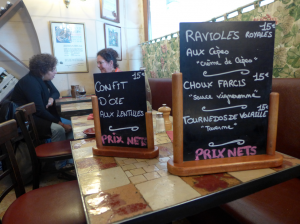 Mr French’s theory is that its because I may be his only French speaking customer who smiles. Monsieur Produce recommended the Orri from Israel. Larger, and slighter paler than most of the others, it seemed as good an option as any. That night’s conversation revolved around the fruit. 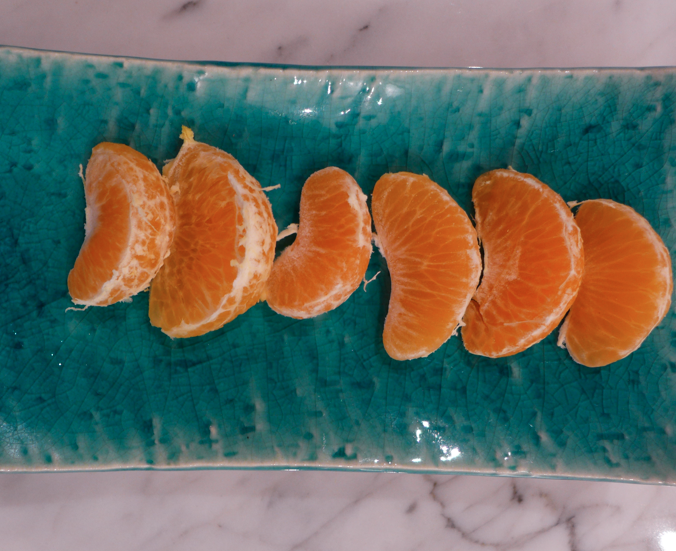 Dessert had not yet finished when M French suggested we do a tasting, a tangerine tasting of the 6 different varieties on the market today. 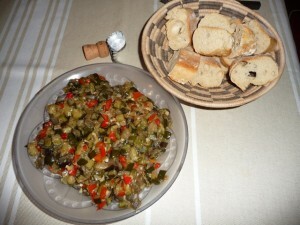 from Italy – too acidic, wimpy flesh and it was the only one with seeds. 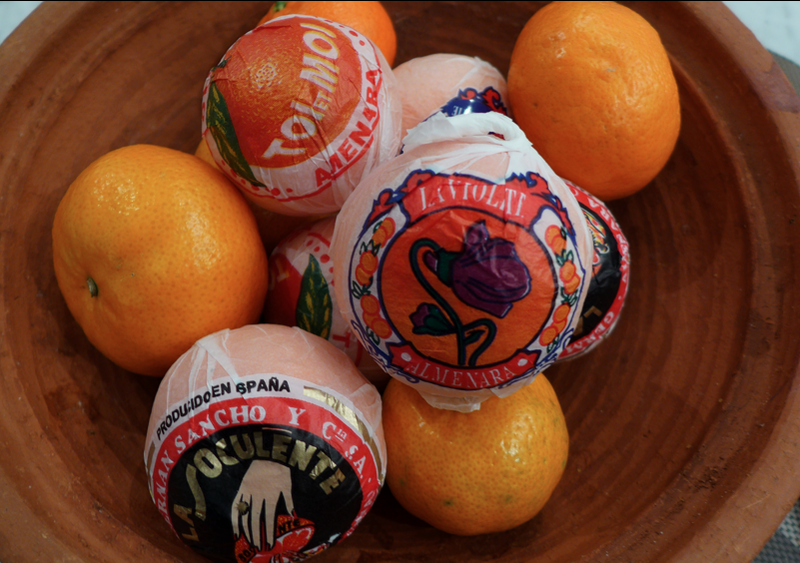 The clear winner was La Violette, but I also suspect it may be the most expensive, which makes the Corsican tangerine, one of the cheapest of the lot, a better purchase for everyday. The Orri came in a close third, but we wouldn’t turn our backs on La Soculente, either. Now I ‘m looking forward to pear season… another fruit with more varieties I have yet to master! Last week I called Mr French at the office and asked if he’d be working on Friday. “Why wouldn’t I work on Friday?” he asked in an incredulous tone that implied I had perhaps fallen on my head. “Because its a holiday?” I ventured forth, no longer very sure of myself and completely incapable of suggesting exactly which holiday it may be. All Saint’s Day. And there you have it. A random Catholic holiday in this laïque country I’ve adopted as my own. The irony is that the majority of the French are not religious, yet so Catholic they just assume all these fêtes are celebrated by everyone. They’re always surprised when I point out that fact, that actually, no, religious Muslims do not put up a Christmas in their home every December and that religious Jews do not break out the chocolate every Easter. Honestly, I don’t really care, as long as I have the day with Mr French to myself, but sometimes I do feel like sending off a letter to the powers that be and suggesting maybe, just perhaps we should get rid of All Saints Day and replace it with something the entire country would appreciate. Something like a Johnny Halliday holiday, a Monet Monday or the Curie Cure long weekend! We spent our morning in jail, and coming out we were rather hungry. 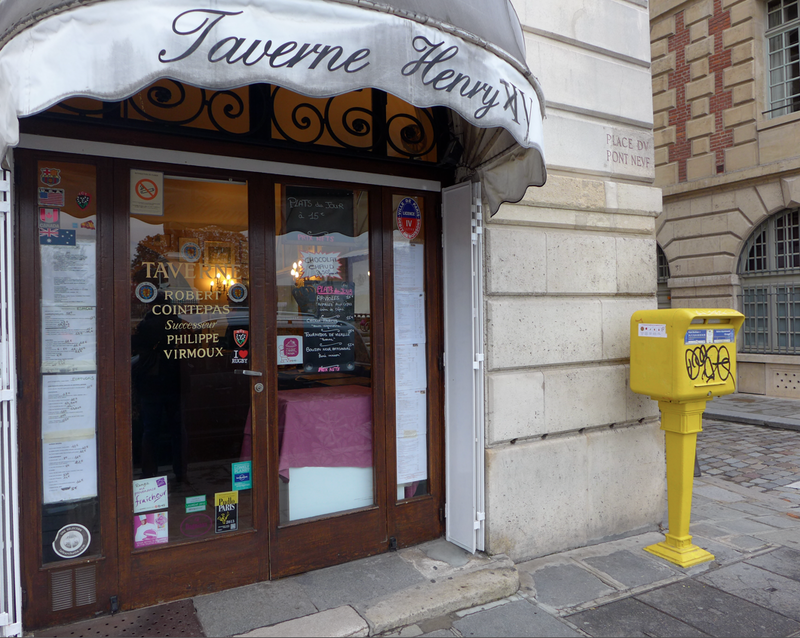 Weirdly, neither of us said a word, we just turned a corner and headed to the Taverne Henri IV, a place we both loved but had never enjoyed together. Taverne is what this restaurant really easy, with an emphasis on fast, hearty meals accompanied with plenty of wine. The owners are what one would call jovial, which really means very loud with a large smile on their faces as they yell out orders and keep everything flowing. There are only 3 mains on the menu each day, plus a selection of tartines and charcuterie plates, and maybe a salad or some other dish pretending to be healthy. The diners are usually lawyers, policemen and clerks from the neighboring courthouse. Serious people who are there for a serious meal. The food is always simple and good, the portions huge. We both had stuffed cabbage that day. 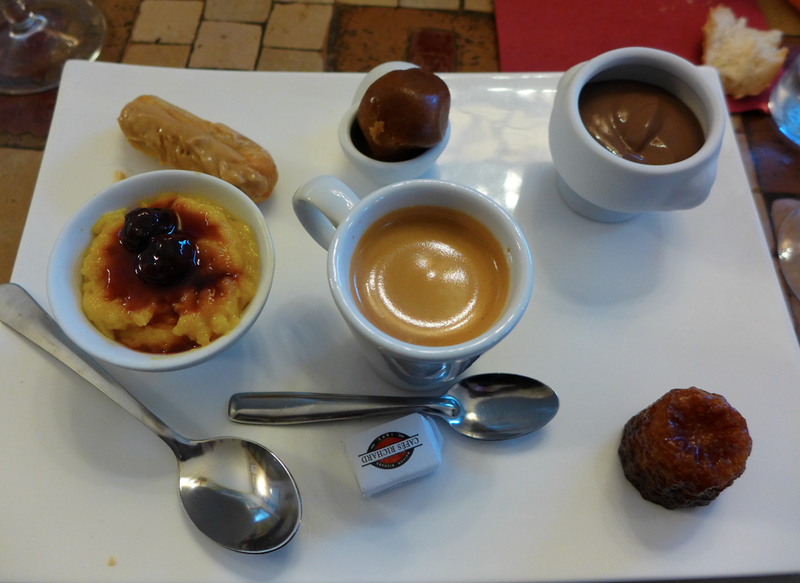 And since it was a holiday, I splurge on a fantastic café gourmand. We were the last table to leave for the day. While standing at the bar to pay, the proprietor offered me a “petite prune”, a little shot of plum eau de vie. When I think of eau de vie, I think of liquid fire that burns going down, but this was mellow and rich and tasted of plums and the bluster autumn day outside. It was absolute perfection. I’ve been rather delinquent about Friday@Flore. The truth is, it is not easy taking those photos. If I stop and ask people, I am setting myself up for a major dose of rejection, as 2 out of 3 locals say no. If I don’t ask my photos are just okay, and a post of just okay photos does not exactly fill me with pride. So this summer, I am giving myself a break as I figuring out how to tackle street fashion photography in Paris. In the meantime, I’ll be running Date Night. Makes me feel more secure, as Mr French rarely rejects me or my advances and should be inspiring for you, if you like food even half as much as I do, because I’ll be featuring some of my favorite restaurants. Last week it was Le 21. Le 21 can be found at #21 rue Mazarine, which means this black painted, curtained clad store front is shrouded in mystery. There is no name to declare proudly for passers-by. Just the address, a large, white 21 painted elegantly above the door. In fact, it is so discrete, that I only found the place because I was early for a date with Mr French at the Prescription bar next door and spent a bit too much time loitering outside. It was clear, as the door opened and someone entered, that something special was going on inside. The discreet entrance says a lot about the chef, Paul Minchelli who once reigned over the stove tops at the Michelin starred Le Duc in the 14th and the glitzy, ritzy Minchelli in the 7th. It was all a bit much, so this man, who is a master with fish and seafood hung up his apron. But his clients simply could not bare the thought of Pais without his cooking and insisted that he continue on, providing him with a cozy little bistrot to work from.The walls are lined with shelves that hold funny objects (I’m pretty sure he has that trout that sings “Take me to the River”) and house made preserves. 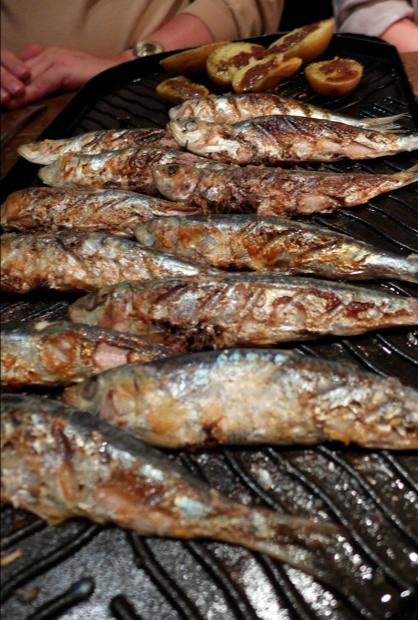 Le 21 is in tourist central, but on most nights the dozen tables are crammed with locals oohing and aahing over the perfectly prepared fish that remind us of our summer holidays by the sea. This is a real chef using the freshest of ingredients, so the menu is brief; only about half a dozen entrées and just as many mains. But who cares when each morsel is pure perfection. Mr French is partial to the chef’s version of fish and chips which is not like any fish and chips you’ve ever had before. The fish is poached and there is an egg involved and it all adds up to a savoury, gooey wonder. I’ll never for get the sea scallops I had on my first visit. Steamed on a bed of seaweed, the lid removed at your table, the smell of the sea washes over you. A sublime moment for a sublime meal. 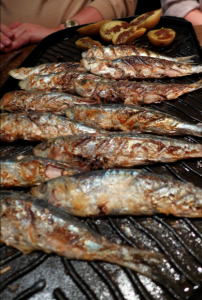 On our last visit I opted for a personal favorite, grilled sardines, which is served on a sizzling grill, each bite sending me back to my very first French Sardinade in Brittany. It was so good I couldn’t bear the thought of dessert. The water changes everything. Light is refracted, reflections magnified. Movement becomes vertical, as well as horizontal. Sound is absorbed. Winding, narrow alley ways create architectural canyons, with a peacefully comforting uniformity. The regular drum of passing cars is replaced by irregular bursts of sound. You are not in a city or in the country, you are somewhere else. Somewhere wonderful. Mr French and I arrived early Friday morning. “Its much more dramatic arriving by train,’ he informed me. I nodded naively, having only ever arrived by bus after a short flight from Paris. We grabbed our bags and headed out the door to the quais in the pouring rain. It was the first time that either of us would be arriving by water taxi. The rain stopped and chipper captain greeted us from his vintage, wood trimmed motor boat, shooing us from the front deck into the back of the boat where the roof top slid open, allowing us to stand and enjoy the breathtaking view. Our chauffeur had a brief errand to run on the island of Murano, and asked if we’d mind a detour. We were thrilled with the free ride and our unexpected stop at a boatyard. Pulling up to the dock of the hotel was luxurious experience and within minutes we were ready to hit the town. First stop, the Punta della Dogana, the large warehouse space that houses the phenominal contempory art collection of François Pineault (CEO of the Gucci Group, now known as Kering). Getting there would require a long walk or a quick trip by vaporetto. Knowning Mr French and his inability to get from point A to point B without stopping at every other church, museum, and shop window and knowing Venise, with its plethora of churches, museums, and shop windows, I insisted on boating it. We didn’t have tickets, or any idea how to acquire tickets, so we just walked on and hoped for the best. Turns out, local authorities rarely check for tickets and we could have gotten free rides our entire trip. The museum was closed until June 1. So we hopped on another vaporetto to check out the Fortuny Museum, featuring the fabrics of the Art Deco artist. The museum was closed until June 1. We walked a few blocks back towards the canal when the Plazzo Grassi, the second Pineault museum WAS open. A huge palazzo that belonged to the Fiat family before being acquired by the Gucci gang, the Grassi is gorgeous. For the first time ever, the museum was displaying the work of a single artist; Rudolf Stingel. The artist commissioned a ginormour oriental carpet and used to cover all the walls and floor of the entire palace. The effect was mesmerizing, and like it or not, it was art. Our quest for art had left us both famished, which made us both a tad grumpy and we got lost looking for our next destination. Just when we started to bicker we came upon a square with a restaurant that had several tables under large white parasols. Mr French grumbled that it looked like a horrid tourist trap. While my stomach was doing sumersaults of joy. We had stumbled upon Aquapazza, one of my top favorite restaurants on the planet. Mr French was somewhat skeptical of my enthusiasm, but was quickly seduced by the fries courgete flowers with a light-as-air ricotta stuffing, while the linguine with lobster was just as good I had remembered. Italians are not known for their dessert, and coming from Paris, we often head straight for the espresso, but this was Aquapazza, where they have fruit gelati served in their original shells; from chestnuts to walnuts, medlars to strawberries, it is all simply divine and served with a frost encrusted bottle of house-made limoncello. We spent the rest of the afternoon meandering the medieval labyrinth of the city, ending our evening over bellinis at the mythic, historic, Harrry’s Bar. I can not, for the life of me, understand why I think anyone would want to read about my non-adventures in finding a Sweet 16 birthday cake for Em. But I had fun, and there are few good addresses buried in here, so I’m sharing. I’m still working at The Agency. Yesterday the family was coming for dinner to celebrate Em’s birthday and I had not figured out the logistics. More importantly, I did not have a solution for the birthday cake. When I work from home, ordering a cake is something I think of while eating my lunch alone at the table. From the office, it had not even occurred to me. Of course, finding a cake in Paris doesn’t sound like it would be an issue, but French pastries are not particularly exciting to a kid who grew up passing them on her way to school every morning. This would not stop a Parisienne mom, but Em and I have always had a special thing about her birthday cake. There was the year she asked me to spread out a tub of chocolate ice cream and cover it with M&Ms, or the year that she wanted a strawberry cake, as in strawberries formed into the shape of a cake with flowers instead of frosting. This year I was left to my own resources, but it was clear, the girl had expectations! Em loves meringues, but random bakery meringues can range from horrible, to divine and it is hard to tell which it will be without testing them first, so I called our preferred meringue supplier to put in an order. Yes, it is true, living in Paris, one tends to develop a rather peculiar list of go-to-addresses and I happen to have a meringue supplier (or two, she added, whistling softly, her hands behind her back and her eyes looking for a place to hide as her cheeks flushed red). Our first choice is always Gerard Mulot. His meringues are delightfully chewy on the inside, and even better, he splits them filling the void with decadently rich whipped cream. Yum! Readers, take note! Those meringues are only available on weekends. Who new? I hadn’t had a clue. So I called meringue supplier number 2, Maeder Benoît. His meringues are the perfect balance of crispy crunchy and ooey chewy, and without Mulot’s whipped cream, they’re totally guilt fat free. BUT : Maeder is closed Tuesday AND Wednesday. At this point, I no longer cared if the meringues were good. Its the thought that counts, n’est-ce pas? So I headed out the door and hit every bakery in a 3 block radius. As the French say, « jamais deux sans trois» There were no meringues. Six months ago I had lunch with La Fashionista at swanky bar/bakery/café. As we left, I stopped at the pastry counter where perfectly frosted, pristine white cupcakes with sparkling silver beads had caught my eye. LF quickly set me straight, they were not cupcakes, they were meringues. They were so gorgeous I took a photo. And that is the photo that came up on my random screensaver as I sat at my desk trying to come up with a Plan D. I got very excited! I called. Not only did Josephine Bakery have meringues midweek, but yes, Madame, they would be thrilled to put 6 of them aside for me and although the bakery closes at 19h, the bar is open until 21h. I would have plenty of time to leave the office at the official 19h, take the metro into the city, transfer trains, and pick up the meringues before heading across the Seine to the pizzeria where 6 take-out boxes would be waiting for me to pick-up before I could hail a taxi home. I was saved! A meringue disguised as a cupcake is a special treat, but it does not exactly shout “Happy Birthday”, and its pretty far from our quirky tradition. Fortunately the 7 year old Em’s strawberry cake had given me an idea for the 16 year old and I filled the cake plate with a kilo of gariguettes, before giving them a generous dose of artisanal whipped cream. The resulting “cake” couldn’t have sung out Joyeux Anniversaire any louder. That’s French for “What a sweetheart!” It also means “Which cabbage?” But ever since this weekend I’ve been thinking about yet another definition,”What a great puff pastry!” On Saturday mon chou, Mr French, and I were strolling through the Place de Furstenberg near St Germain des Pres when he espied La Maison du Chou. In this heavily touristed, bakery deficient zone, he had spotted a bijoux of a pastry shop with checker tiles floors, stone walls and pastries. Gorgeous, golden puff pastries in pristine glass jars, on marble counters and in a large woven basket. We had a hard time believing our eyes, as just weeks ago it seemed that the space had been a tiny art gallery. The place was so darn, well… chou that I had to go in and learn more. Turns out we weren’t imagine things, they had just opened shop. And what a shop! Meilleur Ouvrier de France and Michelin 2 star chef, Manuel Martinez is the mastermind behind this new concept and I intend on becoming one of his biggest cheerleaders. 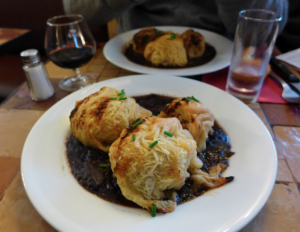 Lately, I’ve had a bone to pick with all the English language foodies who come to Paris because they simply love French food and then start raving about food trucks and taquerias and cupcakes here in Paris. Not that I have anything against food trucks or tacos. I love ’em both, but I’d never stand in a long line for them and I see so need to share the idea in the English language press. Not to mention that they are both better in the US (or Mexico). I’d rather encourage anglophones to support local delicacies and with La Maison du Chou, I get to do just that. Forget cupcakes, head to La Maison du Chou where the choux are filled to order, a pastry chef injecting plain, chocolate or coffee flavoured cream on demand as customers wait in line. 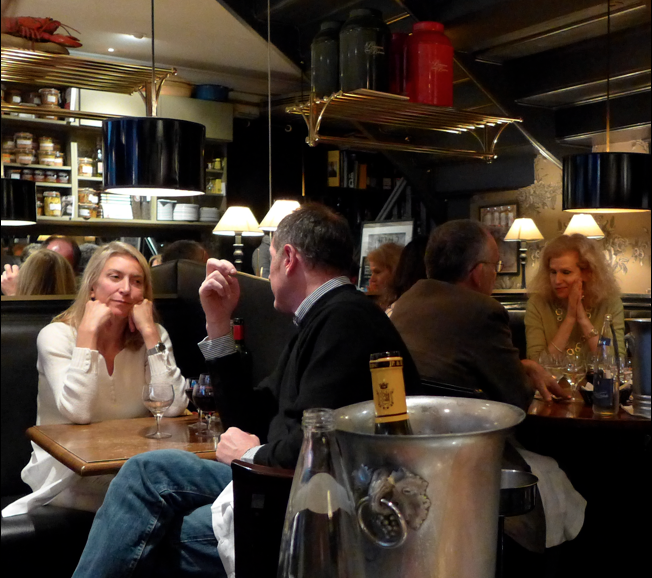 Mature, stoic, elegantly clad Parisians, looking over the counter like hungry school children. Its fabulous. And the pastries are not filled with just any cream. Instead of the traditional pastry cream, these choux feature an original fromage blanc mousseline. Simply delicious. Last week I was talking about Mr French’s Christmas present, which he only received in March. He also got one in February! 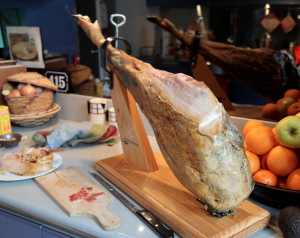 Every December someone in Spain sends Mr French some Spanish ham. Which does not sound like a major feat, but it is. 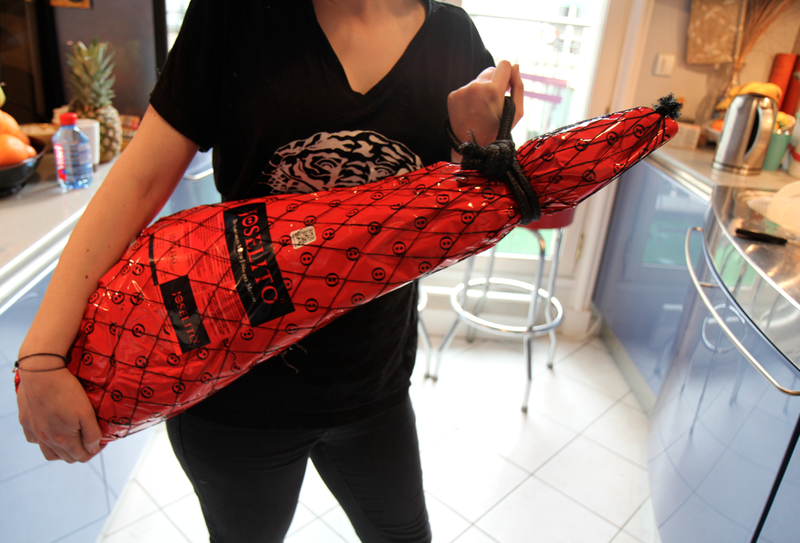 Last year a wine bottle travel with the ham broke and created a bloody looking mess. This year, the ham got lost, stuck in a large warehouse, just a few miles from our flat and totally unaccessible. Because it is a gift, I could hardly call up the sender and say, “Thank you for the lovely thought, but your gift never arrived.” So the sender was not thanked, which he found odd and called to inquire, then learning about the mishap and setting things right. So it arrived the last week of February, just I was stepping out the door to catch the Eurostar for London. I had my bags, Mr French’s bags and I was preoccoupied with some teenager mischief Em had gotten into when the guardian stopped me. He opened the door to his office space and I saw what looked like a coffin for a very large dog. 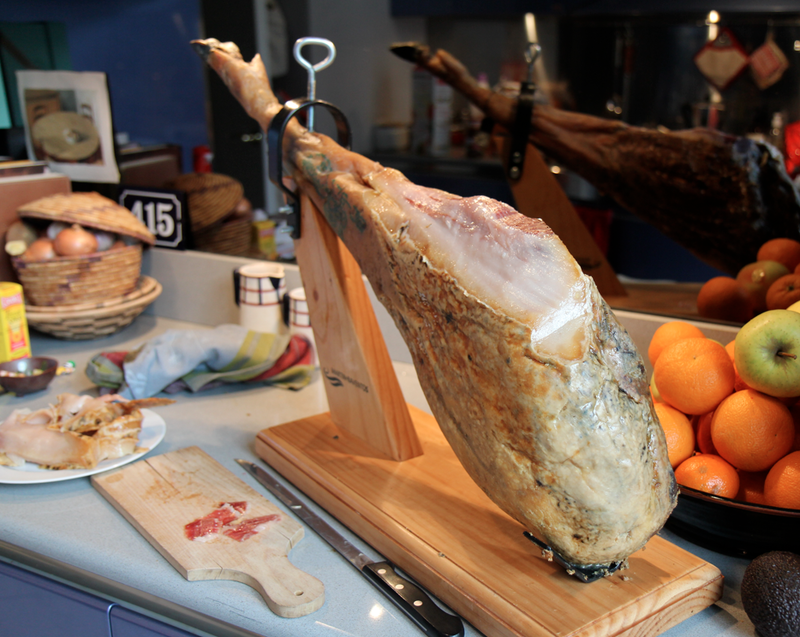 The ham had arrived. 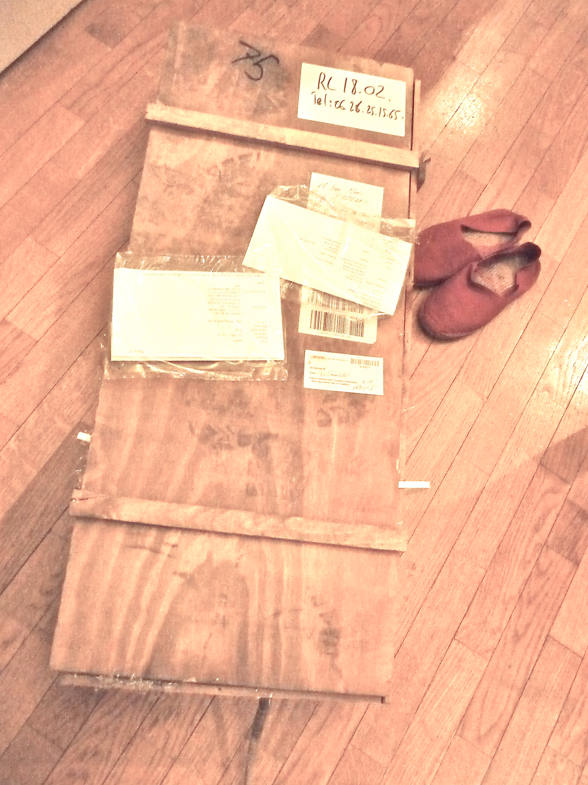 Mr Le Gardien carried the wooden crate to our door, I threw it in and let it sit there until our return. On the train, my phone rang. It was Em. “Mom, the ham arrived.” The next day Mr French’s phone rang. It was his son who was staying at the flat because Em is only 15. 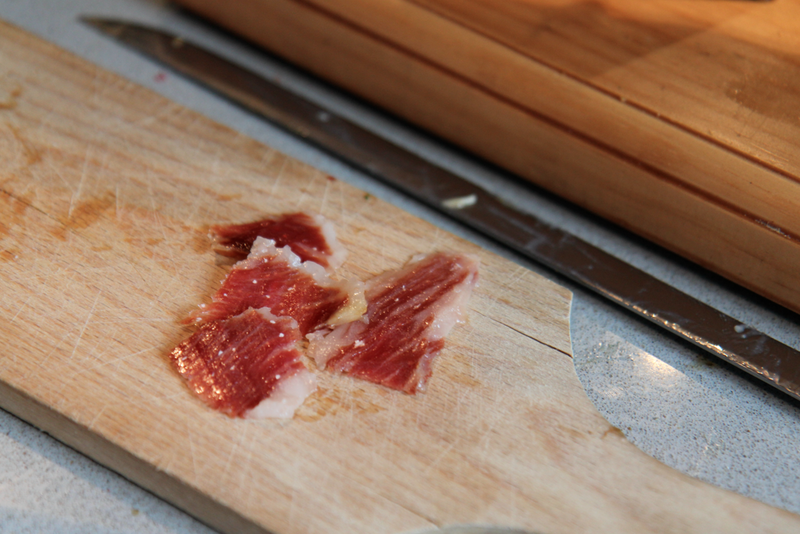 The ham is a major deal for our young’uns. Seriously, you’d think I hadn’t left the house stocked full of healthy pre-made food for them to scarf down. Everyone loves it. My favorite part is that it comes with 6 bottles of some really outstanding Riojas. Mr French loves the elaborate hardware we’ve had to acquire to deal with the ham. After London we immediately headed to the Alps skiing, so it was only recently we got to start hamming it up! Its Valentine’s Day and you’re probably going to be hearing a lot of sappy talk about love and romance, but that’s not me. I’m a pragmatic girl and all that public waxing is for someone else. Unless we’re talking chocolate. Then, I’m in! As a kid, I thought I hated chocolate and was pretty proud of being different like that. 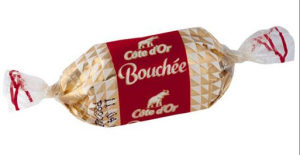 At sixteen I came to Paris and stayed with a 17 year old Parisienne who had a food addiction and at night she’d sneak into the kitchen and surreptitiously gobble down the chocolate her mother had tried to hide. It was while joining her on one of those raids that I realized that the waxy, chalky, nearly flavourless planks I’d been raised on, were called Hershey bars, not chocolate bars for a reason. There I’d been telling the world I didn’t like chocolate, when I’d never actually had chocolate. At least, not real chocolate. Now that I had, I was in love!!! Gerard Mulot’s mediant bar (that is not the official name, but that is what it is). As my name for it implies, this bar has lots of candied fruits and nuts sitting atop a thick slab of perfectly temper dark chocolate. 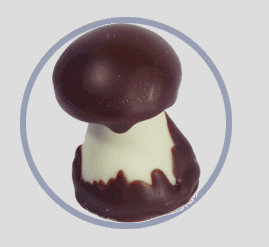 And although dark chocolate can sometimes have serious bite, this one melts on the tongue with the intense chocolate flavor. 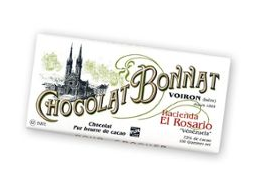 Bonnat Grand Cru chocolate bars, particularly the ones from Venezuela. I first discovered these bars at a grocery store in San Francisco. I was with Mme Beast Cadet and we’d been sent out by the men folk to get wine for the dinner they were cooking up. 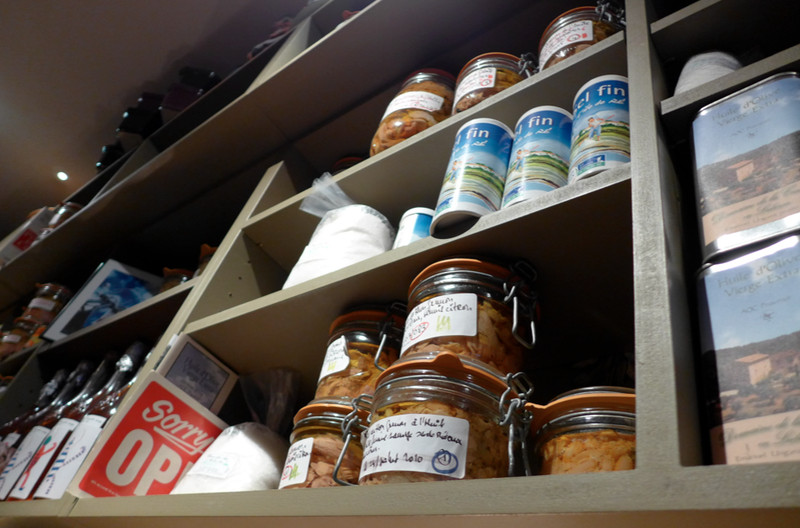 We choose some very fine wines, and discovered the Bonnat bars in the check out line. Without further ado, we chose a bar from each estate, knowing a serious tasting was in order. 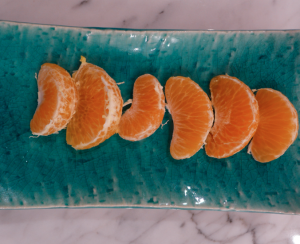 The tablette du jour by Jean Charles Rochoux available only on Saturdays, because each bar is enriched with large chunks of the freshest, most tempting fruit he found at the market the previous Friday. When I complained to JC that the bars were messy to eat and suggested he place the fruit more evenly, he protested that the mess was part of the childish delight of enjoying bar. I’ve been a fan ever since. Patrick Roger bars are Mr French’s favorite. Roger is famous for the elaborate chocolate sculptures of the unexpected, like hedgehogs and the Berlin Wall. One year he tried to build an elephant, much like the one I’d admired as a student, only life-sized. After three months of devoted effort the trunk collapsed and Mr Roger went into a little déprime. I’m guessing that his excellent, estate select chocolate bars are what helped revive him. 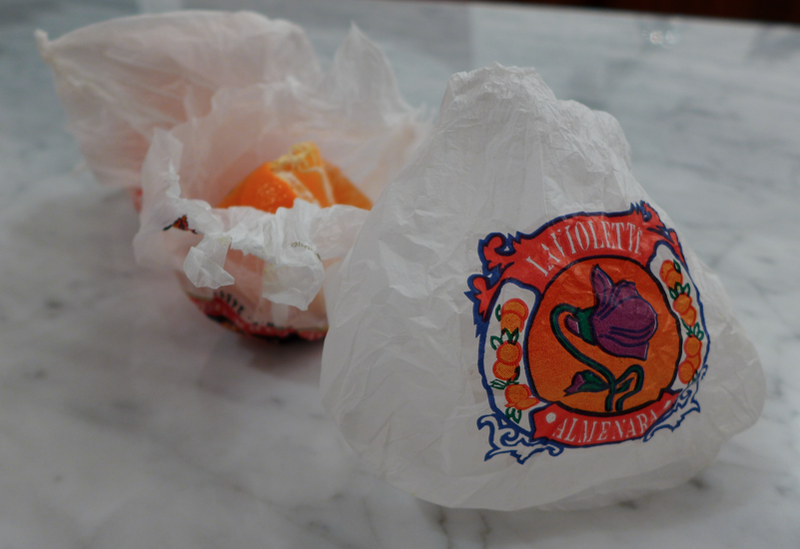 …the king’s cake, in any case, aka la galette des rois. For those of us not up on Catholic culture, the Epiphany is January 6 and it marks the 12 drummers a drummin’, as in the last day of Christmas, which is a pretty big deal in Catholic countries like France. To celebrate there is a cake made of flaky pastry crust and traditionally filled with frangipane, which is pastry chef lingo for an almond paste blend. These days chefs get creative making them with hazelnuts (Poilane), pistachios (Eric Kayser) and even chocolate (Jean Paul Hévin). The cakes are good, although to be honest, I find them a bit dry and too buttery for my palette and I’d be rather slathering fat on my hips via a tangy tarte au citron or a simple chocolate, but this doesn’t stop me from gobbling them up the instant they hit the pastry counter every January. 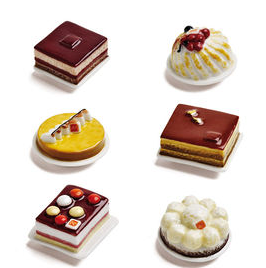 Being a Material Girl, I’m addicted to the tradition that comes with the cakes; each cake hides a fève (bean) and whoever gets the piece of cake with the “bean” is the king or queen for the day, in honor of Melchior, Balthazar and Caspar. The cakes are sold with a crown, sometimes two, so the king can choose his queen (or vice versa). If strutting around in the house wearing a crown and getting to boss my indolent teens around for a day was not tempting enough, the modern “bean” is usually a small porcelain model that people love to collect. It may be a character from Tintin, or a gorgeous pastry, it may be an Eiffel Tower, or a vintage coke bottle. Being a practical girl and not into things that attract dust, my very favorite fèves are the ones you can wear, so every year, as magazines and food bloggers scope out the best galette in Paris and debate the merits of the galettes sliding out of the ovens at Du Pain et Des Ideées v Jacques Genin, I’m pounding the sidewalk looking for the best fèves in town. In years past, I cracked for the oak leaf crown porcelain rings at Polaine (2006) and the crown adorned pendants at the Bon Marché (2011). 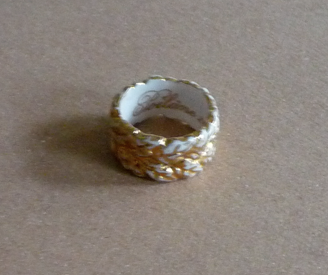 This year our first galette came from Mulot bakery, which a gold ring fèves that is fun to wear on the pinkie and this weekend, for the real Epiphany I plan on doing my shopping at Dalloyau, which is rumoured to have porcelain star pendants. 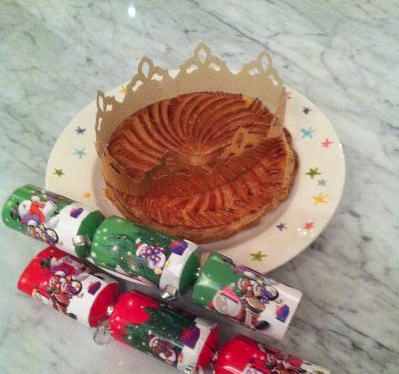 C’est la galette des rois. Chouette. Après 5 semaines à me gaver comme un oie (nous, les américains, on commence fin novembre avec Thanksgiving, puis c’est mon anniv, et Hanukkah, suivi par petite soirée pour décorer le sapin avec nos gosses…) nous voilà le 1e janvier, ma poche pleine de bonnes résolutions ; faire du sport, m’abstenir de l’alcool et perdre les 4 kilos que j’ai de trop… mais non, parce que, c’est la galette des rois !!! À vrai dire, je ne suis pas fan de ce gâteau avec sa pâte feuilletée un peu trop sèche pour mon goût, mais je suis une accro confirmée des fèves. 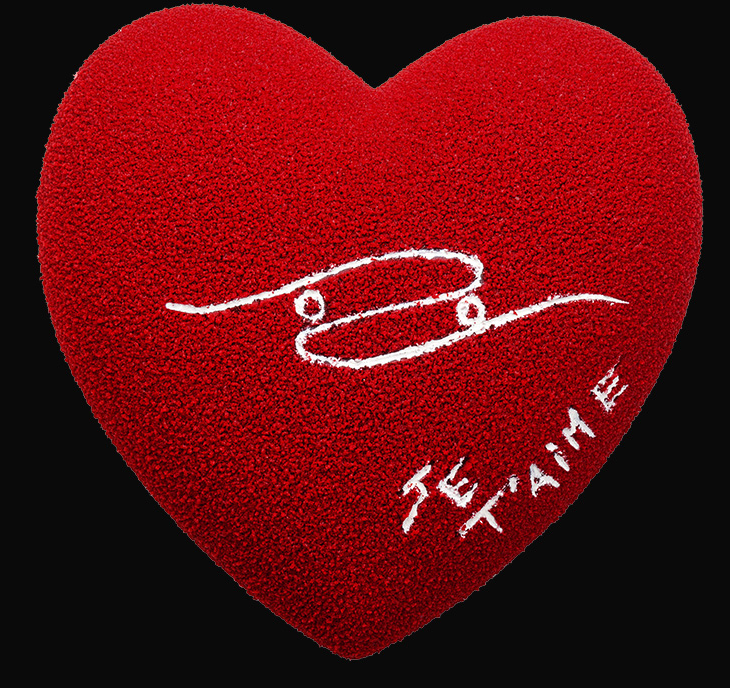 Surtout les fèves bijoux qu’on peut sortir de sa boîte à bijoux le 1 janvier et porter pendant toute le mois. 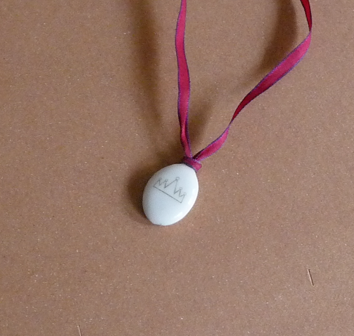 Les fèves comme ma bague en porcelaine doré, decorée en couronne de feuille de chène (Poilane – 2006) ou le pendentif avec une couronne de princesse (La Grande Epicerie du Bon Marché – 2011). 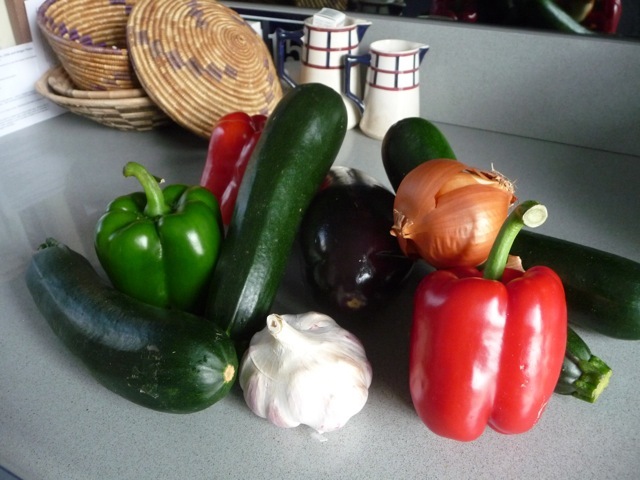 Always on the look out for new food to prepare, I jumped at the opportunity to learn a new recipe when the Chief Parisienne suggested we prepare dinner together. Her family has a home in the South of France, so I was not surprised when she declared that we’d be making ratatouille, although I was surprised that she makes it without tomatoes. We already had Herbes de provence and garlic at home. In the kitchen we opened a bottle of Sancerre and drank to our health. 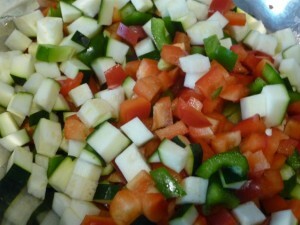 Then we minced about 1/3 of the head of garlic and diced all of the veggies into small cubes. The pieces were about the size of a fingertip and she kept reminding me to make them smaller, but be safe with that knife and don’t add the fingertips themselves! In a spaghetti pot (Parisiennes have tiny kitchens and make do with whatever pot is on hand, at home I use a large frying pan), the CP sautéed the onion and garlic over med-high heat, adding a pinch of salt. When the alliums were soft and transparent she added the eggplant. About 5 minutes later the rest went in, including a pinch of herbs with a few turns of the pepper mill. In another 5 minutes we turned the flame down to low and headed into the living room for a second glass of wine. Every now and again, the CP would return to the kitchen and stir things up. At some point, without telling me, she added a cube of sugar. I took my hot veggies home in a tupperware, grilled a few lamb chops and got to bask in the title Kitchen Goddess for the rest of the week. The following week they were all clamouring for more. I set to work, but no matter how hard I tried, I couldn’t get the right taste, which is when I remembered that the CP had disappeared into the kitchen on more than one occasion. So I made a brief phone call, and sure enough, we’d forgotten to mention the sugar. One cube later, and it was perfect! This dish takes longer to prepare than most meals I make, but even the gourmet pre-made versions are about 50% fat. Double batches are easy to cook and it freezes well, so it is worth the effort. 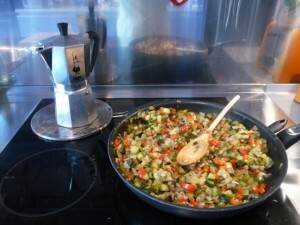 VARIATION: Heat the ratatouille up in a large skillet. Crack two eggs over the simmering vegetables and let them cook through. YUM!